LIKE PAUL AT MILETUS, Jan Hus bid a tender farewell to his congregation at Bethlehem Chapel as he departed for Constance. We think of him as “Jan Hus, the martyr.” But before that, he was Jan Hus, the pastor—passionate about reform yet gentle toward his flock. The Council of Constance charged Hus with “Wyclifism.” The charge misrepresented Hus’s theology (Martin Luther would later criticize Hus for accepting too much Catholic doctrine) but caught the spirit of his attack on the excesses of the medieval church. What Hus desired was not a radical shift in church teaching, but for the church to be more worthy of its calling. This meant a return to the model of the early church and a complete re-evaluation of what it meant to be a priest. First, Hus believed a priest’s authority should be tied to his character and not merely his office. Naturally, this shook the foundations of the Roman Catholic hierarchy, which maintained that as long as a priest was in good standing with the Church, his ministry would remain effective regardless of his morality. Hus did not go so far as to deny the ministry of immoral priests. He maintained that sacraments in the hands of an unworthy priest remain valid, but the usefulness of the priest is undermined by his unseemly behavior. Second, Hus wanted to narrow the gap between priest and people by giving lay people access to the Communion cup. Restoring the laity’s right to take the chalice in Holy Communion became the battle cry for the whole Hussite movement. Finally, Hus denounced as blasphemous the claim of priests to forgive sins directly, of their own power, whenever and wherever they wanted. He growled and barked at the practice of some priests who demanded money for such “forgiveness.” Hus emphasized that it is God and Christ alone who forgive sins. Priests only declare such forgiveness. The Czechs generally rejected the idea that the Church is restricted to the pope, cardinals, bishops and clergy. Hus insisted that the Church comprises the common people, the nobles, and the clergy. The clergy, he said, constitute the best part of the Church if they perform their duties rightly, but that means they should relinquish the world and follow Christ most closely. If they are unfaithful to their duties, they become the worst part of the Church, laboring against Christ. In 1402, professor Hus was named rector and preacher of Bethlehem Chapel, which had been founded with the clear purpose of providing preaching in the Czech language. Except for the cathedral, where his colleague Peter of Stupno delivered sermons in Czech, there was no church in Prague with preaching in the vernacular. After this appointment, Hus continued his practice of gathering students about him and teaching them. A hospice called Nazareth, built in the immediate vicinity of Bethlehem, provided students room and board. Hus supervised both chapel and hospice. Even the chapel walls proclaimed a message of reform. They were decorated with several pictures, always arranged in pairs. One of them portrayed the pope astride a large horse, resplendent in all his papal pomp; its counterpart portrayed Christ in all his poverty, carrying the cross. In another set, the pope was depicted sitting haughtily on his throne having his feet kissed, while Christ was shown in a kneeling position washing his disciples’ feet. Hus approved of this use of pictures in the churches, provided they were not worshiped for themselves. He held that pictures were useful because the common people could not read and because the mind has a surer grasp of concepts when they are seen as well as heard. Some scholars consider these letters from Hus during his months of imprisonment “among the world’s treasures.” Many of the letters remind us of the apostle Paul’s prison epistles. They reflect his pastoral heart like none other of his writings. 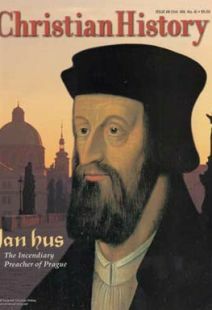 To the very end, Jan Hus was an ardent reformer with a pastor’s heart.